I'm making slow progress on this month's UFO. 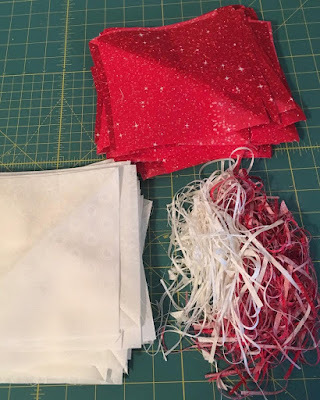 Because I added some width to the pattern in order to meet the QOV size requirements, I made 48 red/red half-square triangles, and 40 white/cream half-square triangles. 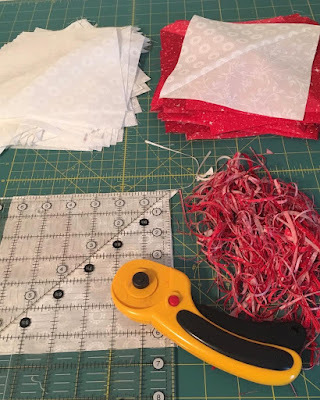 Whenever a pattern says to make two HSTs at a time from a square of fabric with a measurement like 6 7/8", I cut a 7" square instead to give myself a tiny bit of wiggle room. Invariably, if I don't add the 1/8", I end up with a HST that is too small. When squaring the blocks, the trimmings are sometimes a sliver and sometimes merely the 1/8", but the blocks are always the correct size. This small adjustment always works for me and eliminates the frustration of having to redo the HSTs. Perhaps the answer to your question in the last post is yes. I know I feel like an antique sometimes. Anyway, what a mural! Kudos for keeping up with your measuring and cutting...a part of the process I don't care for (having a crooked eye and all, lol). Agreed! Those silly measurements are not realistic for us who use rotary cutters anyways! lol This is the best way! I always do the same size adjustment. The blocks are always more accurate once I "sliver trim". Look at all the fabric spaghetti!!!! That would make good pillow stuffings! 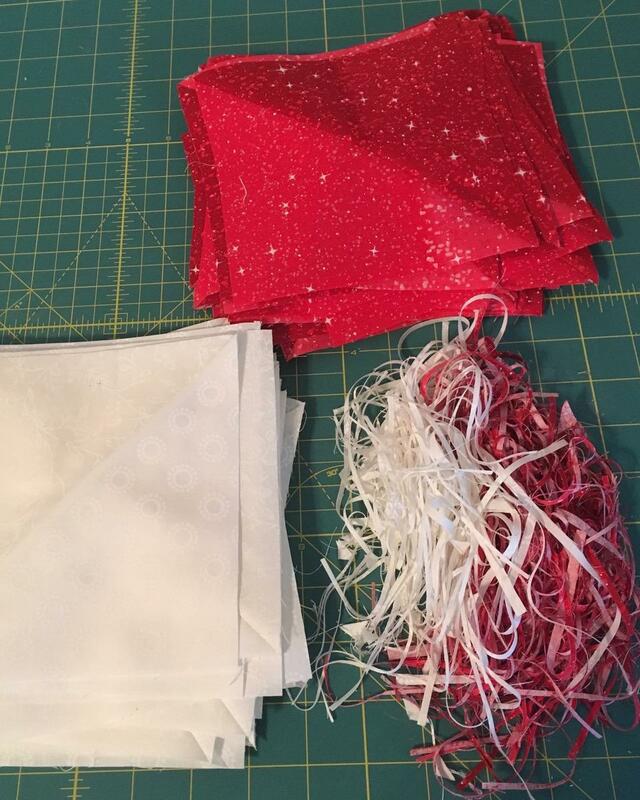 Holy Moly - that's a lot of HSTs and a lot of trimmings! Now I know why my friend's quilts were so wonky (she has no patience and also no longer quilts - lol). For the very few quilts that I have made I did the same thing. Just a touch bigger because once I trimmed they always seem to be the right size! You amaze me with how much you get done. I had the same problem with a kit I bought from Connecting Threads. I'm now a big fan of wiggle room. You can always cut it off but you can't add it on. Lots of blogs today seem to be about individualizing patterns . I think it is great that so many of you can do that so well! Great idea - better a slight smidgeon too big than too small! I'm interest to see how this one turns out! I agree with you completely. My Accuquilt cutter has great dies for various triangles that make perfectly sized half triangle units. But I only cut with it if I have a lot of cutting to do.